We have several ranges that are bespoke to the work you wish to be c married out. See below a brief description of each range and click on the range button to find out a aggregate, glass or gravel for you? 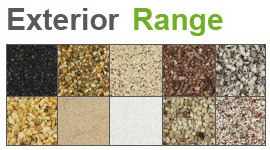 Our wide selection of crushed rock and gravel offers a wide array of textures and colours ranging from light sand and Dolomite Marble to White Flint and Bronze, with such a wide choice of colours and textures you can be assured we have something to fit your project, choose s single colour to a totally custom design to suit you. Click Here to view our Exterior Range. 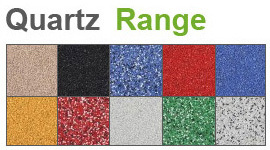 Internal quartz surfaces are manufactured using fine quartz particles mixed with resin, this mix provides a close knit smooth finish that is particularly suited for areas requiring a high level of aesthetics such as in retail or commercial applications. The surface also provides high levels of anti-skid properties. 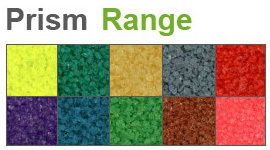 There are many materials that work effectively within resin bound colourful Paving, below are just some of the materials that can be used. 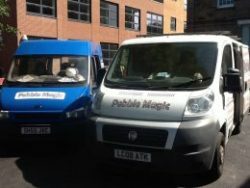 Glass, Ceramics, bricks, shells and even plastic can produce unusual and unique finishes for a large range of both domestic and commercial projects.